Unemployment, overspending, and maxed-out credit cards all add up to one thing: a country deep in debt. Do you have several credit cards that you can barely meet minimum payments for each month? You may not even know how much you owe. You are not alone. Many Americans are struggling to get out of debt, and credit card debt can be the toughest kind to get rid of because the banks only require minimum payments. 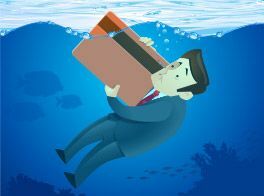 But those high interest rates mean that you could be drowning in debt forever with your head barely above water as you struggle to stay afloat. If you feel like you’re the only one struggling with debt, our statistics will tell you otherwise. Who’s carrying a balance on their credit cards, and how big is that balance on average? Which state has the highest credit card debt per capita? Hint: it’s cold up there, and you might be able to see Russia. Whether you owe a little or a lot, knowing the dos and don’ts of debt management can help you get those balances down to zero and get you safely to shore. Here are some surefire ways to get a handle on your debt. You can apply for any credit card that is good for your credit score. To find such card, you can use our Credit Card Navigator.